bought it four years ago. With great word of mouth advertisement, he has customers who seek him and his company out for all of their landscaping and gardening needs. Now he is ready for new customers and clients to benefit from his expertise. Sawyer grew up around his family’s various companies doing excavating and building. He has an electrician in the family and his wife is a florist. “We have a lot of businesses in the family. That’s a lot of support and knowledge,” Sawyer said. 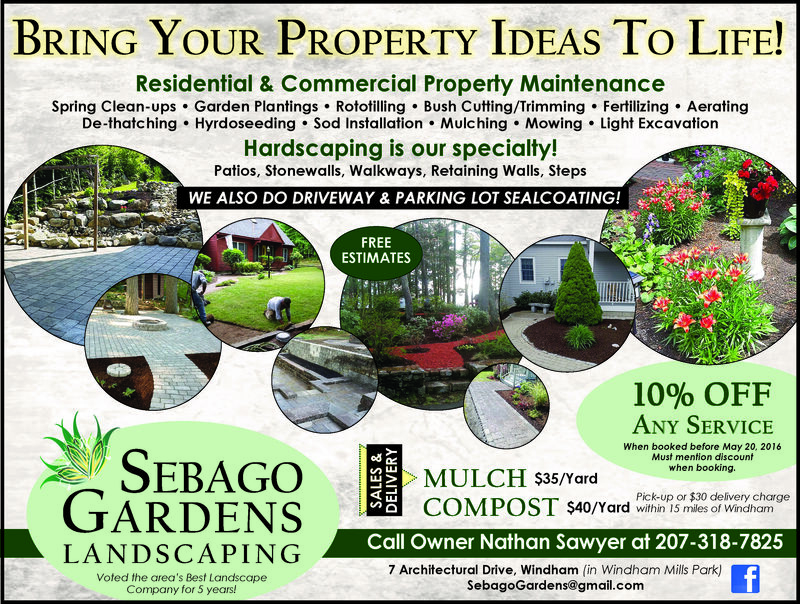 Sebago Gardens Landscaping does spring clean ups, mulching, lawns (hydro seeding and sod), mowing, weeding, planting shrubs, flowers, vegetables, landscape lighting and some excavating. Sebago Gardens Landscaping will also do stonework and hardscaping, creating gardens, retaining walls and walkways for new or existing properties. They can take a bare lot and create the yard that will wow friends and family. The company has many corporate clients like Portland Housing, Aroma Joe’s in Windham, the plaza with Studio Flora on Route 302 in Windham as well as quite a few banks, condo units, and of course, residential properties. “Customer service is big with us,” said Sawyer. Sawyer employs seven or eight people on two crews, a mowing crew and a labor crew that does complete yard renovations. His customers range from people he has worked with for years and others like real estate professionals who want to make a property look nice for pictures or for a showing. Often times, rental agencies contract him to fix up rental properties before clients move in. Located behind Rose’s Italian Restaurant in Windham Mills Park, Sawyer offers mulch and compost pick up at his location or he will deliver to your location for a small delivery fee. In the winter time, in addition to plowing, sanding and snowblowing, Sawyer builds one-of-a-kind furniture out of birch logs. He can also use some of his building skills when creating a backyard oasis for his clients. Sebago Gardens has also dug foundations for new construction. He can do just about anything and encourages customers to call him and ask if they are unsure if what they need is something he can do. On January 15 of this year, Sawyer was recognized by the Maine State Police for his involvement in the community with the Business Recognition Award for Maine. Sebago Gardens Landscaping is involved in Project Everlasting Gratitude with Studio Flora, his wife’s company, which provides a wreath for every Veteran grave in Windham just before the holidays. He also donates to the schools and gives back to the community whenever he can. Sebago Gardens Landscaping offers free estimates and billing at the end of each month. There is no job too small. From a weekly mowing to installing patios, steps and stonewalls, Sebago Gardens can do the job right the first time. Sawyer is a dog lover and can be seen with his pup all over town. For more information or to get a quote, call 318-7825, email sebagogardens@gmail.com or visit them on Facebook to browse some of their top of the line work. Well done ! I am happy for you, Your landscaping business is growing since four years And you are doing better. Get the best Residential Landscaping Services Newport News according to your needs.